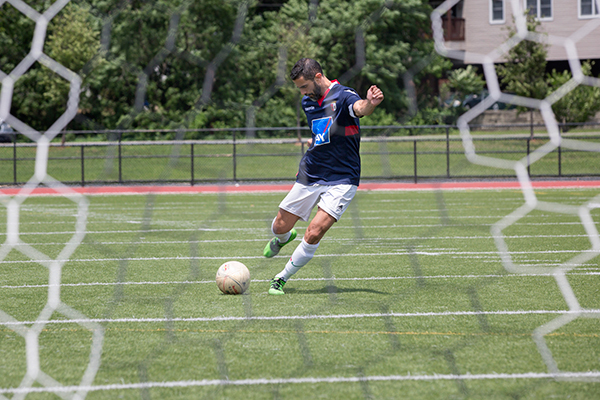 It was a night game and raining lightly when Dennis Machado planted his foot the wrong way during one of the semi-pro soccer games he's been playing for years. He felt a sharp pain, heard a pop and knew he damaged his knee. It swelled immediately and he figured he tore a muscle, maybe injured a minor ligament. But his diagnosis was much more serious - a torn ACL. He thought his playing days were over. But Dennis, 32 at the time, couldn't quite come to terms with the possibility that he might have to give up his favorite pastime. He met with three different doctors to see what could be done. One said he could patch Dennis back together but the procedure might have to be done again. Others told him he should stay off the field. Then Dennis met with Dr. Raphael Longobardi, a board-certified orthopedic surgeon specializing in sports medicine and athletic injuries. He is Chief of Orthopedic Surgery at Holy Name Medical Center. "He told me he would do this once and that's it - I wouldn't need a second surgery," Dennis said. "He relies on science and brought data to show me about the latest advances in these types of surgeries. He is well-informed on the best techniques and is willing to abandon the old when something new comes along to better help his patients." The ACL, anterior cruciate ligament, is one of the four main ligaments that connects the upper and lower leg bones. It runs diagonally across the knee and keeps it stable. "Everything went so well - Dr. Longobardi, the staff at Holy Name - everyone made sure I understood what was happening and made me feel comfortable," Dennis said. Dennis had his same-day surgery in August and by November he was running five miles at a clip. In February he was already practicing and never lost any game time. That was three years ago and he continues to start for his team. "Dr. Longobardi gives so much attention to detail," Dennis said. "He did such a great job I've referred about 10 people to him."